Most people are aware that ongoing and future sea level rise will contribute to increased flooding of coastal cities. Urban flooding can result from large storms, like Hurricane Sandy in 2012, which inundated parts of New York and New Jersey and caused $50 billion (US) in damages, or more frequent but smaller “nuisance flooding” events, which now hit places like Miami Beach and Fort Lauderdale, Florida several times a year (Figure 1). These examples hint that, at least for some low-lying areas, the future is now. What is not clear from these examples is how much worse things could get. Some studies suggest that millions of coastal residents are already at risk, and that this number could grow quickly. Figure 1. 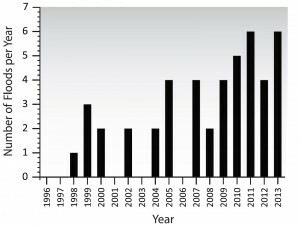 Frequency of flood events in Miami Beach, Florida. Modified from Wdowinski et al. (2016). One of the challenges scientists face in warning the public and policy makers about the dangers of global warming and sea level rise is the problem of time lag. Given human nature, threats that are not immediate tend to get ignored. Carbon dioxide (CO2) that we emit into the atmosphere today doesn’t have much of an immediate climate effect, so it’s easy to ignore the problem. But today’s CO2 emissions will continue to warm the planet for at least a few hundred years, and possibly thousands of years, because it takes a long time for natural processes to remove excess CO2 from the atmosphere. People alive today won’t experience the worst effects of our present CO2 pollution. Our great-grandchildren, and their great-grandchildren, will get stuck with the bill. The Intergovernmental Panel on Climate Change (IPCC) currently forecasts between a half to one meter (up to three feet) of global sea level rise by the year 2100. The uncertainty in the estimates is large and reflects in part the political uncertainty of future CO2 emissions. Most of the future sea level increase will come from the ice sheets in Greenland and Antarctica, which lose mass as temperatures rise from a combination of melting and iceberg calving. However, the IPCC numbers likely under-estimate these contributions. Greenland started to experience accelerating losses two decades ago, about the time (perhaps by coincidence) that Miami Beach started to flood. Satellite observations suggest that Greenland’s acceleration is continuing. The Antarctic ice sheet is also starting to show signs of disequilibrium. Recent studies suggest that the West Antarctic ice sheet has already started to show signs of collapse, which could add 3-4 meters (10-12 feet) to sea level in a relatively short time. Unfortunately, accurate forecasting of future sea level rise is difficult because of the unknown time lag between increased atmospheric CO2, increased global temperature, and ice sheet response. One approach is to look at past sea level “high stands” (old shorelines mapped by geologists) during periods of past climate warmth, to get clues as to how high sea level can ultimately go for a given climate condition. Atmospheric CO2 now exceeds 400 ppm, and will likely hit 500 ppm by mid-century. The last time CO2 was this high was several million years ago. Earth then was much warmer, and sea level was much higher, although exact amounts are debated. Evidence closer to our own time would be better – more relevant to current conditions, and also easier to figure things out, since there’s been less time to “muddy the record.” The best evidence comes from places where the land has been geologically stable for a long time, such as the Florida Keys. By determining the age of rocks containing certain types of coral (ones that need sunlight, and hence were formed underwater at some fixed depth) and measuring their current elevation, geologists can figure out how high sea level was at various times in the past. It turns out that 125,000 years ago (a blink of the eye in terms of Earth history) sea level was 5-9 meters (16-30 feet) higher. Surprisingly, climate conditions (and Earth’s average temperature) 125,000 years ago were similar to today. What’s going on? If the ice sheets grow or shrink mostly in relation to Earth’s average temperature, why don’t we already have much higher sea level? The simplest explanation is that there is a time lag between sea level and atmospheric CO2 – today’s sea level has not yet “caught up” with CO2 and our soon to come hotter temperatures. The bottom line is that 5 to 9 meters of sea level rise is the range we should be using now for long-term planning. It won’t happen in the next few decades, but it will happen eventually. We don’t know exactly when, but again, geology can give us some clues. Studies of old shorelines that are now drowned off Florida’s coast show that 5-9 meters of sea level rise can happen in a few hundred years. That may seem like a long time to some people, but it’s important to remember that those high rates of sea level rise were “natural” – they occurred when Earth’s climate was not influenced by humans or out of balance. The current rate of temperature rise is a factor of ten faster than those earlier natural periods, so sea level could rise much faster in the very near future. That’s one of the reasons scientists are putting so much effort into studying the behavior of Earth’s ice sheets – they may signal when a catastrophic rise in sea level is imminent. Current information on the ice sheets is is not encouraging. Policy makers, urban planners, financial markets and the public are not prepared for the coming sea level high stand. We need to remember that this is not a worst-case scenario. It’s a plausible scenario, but one that is delayed by some unknown amount because of time-lags in Earth’s response. That time lag could be a few hundred years, but could also be less. In either case, some long-term planning is called for. Data Sources and Further Reading. Archer, D. et al. (2009) Atmospheric lifetime of fossil fuel carbon dioxide. Annual Review of Earth and Planetary Science, 37, 117-134. Brigham-Grette, J. et al. (2013) Pliocene warmth, polar amplification, and stepped Pleistocene cooling recorded in NE Arctic Russia. Science 340, 1421-1427. DeConto, R. M. and D. Pollard (2016) Contribution of Antarctica to past and future sea-level rise. Nature 531, 591-597. Dixon, T. H. (2017) Curbing Catastrophe: Natural Hazards and Risk Reduction in the Modern World. Cambridge University Press, 300p. Dutton, A. et al. (2015) Sea-level rise due to polar ice-sheet mass loss during past warm periods. Science 349 (6244). aaa4019. Golledge, N. et al. (2015) The muti-millennial Antarctic commitment to future sea-level rise. Nature 526, 421-425. Hauer, M. E., J. M. Evans , D. R. Mishra (2016) Millions projected to be at risk from sea-level rise in the continental United States. Nature Climate Change, 6, 691-695. Hine, A.C., D. P. Chambers, T. D. Clayton, M. R. Hafen, and G. T. Mitchum (2016) Sea level rise in Florida: science, impacts, and options. University Press of Florida, 179p. Hoffman, J. S., P. U. Clark, A. C. Parnell, F. He (2017) Regional and global sea surface temperatures during the last interglaciation. Science 355, 276-279. 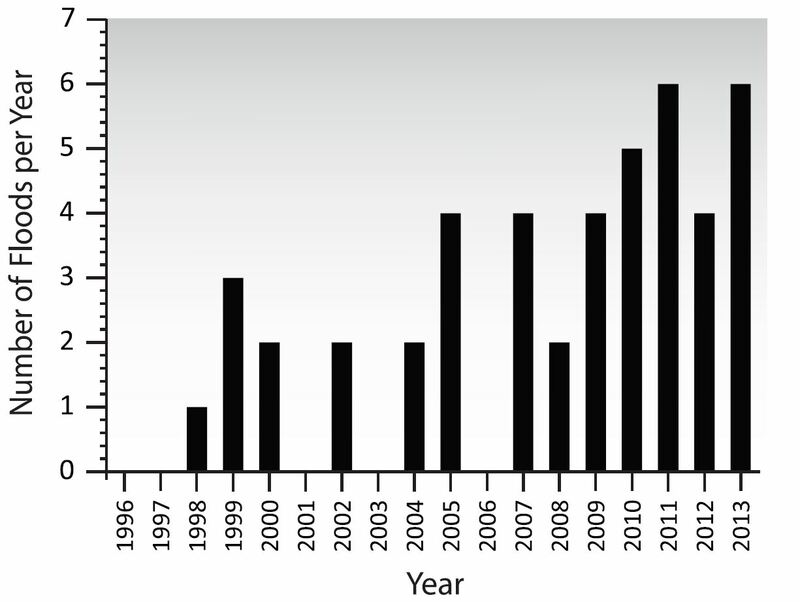 Locker, S. D., A. C. Hine, L. P. Tedesco, E. A. Shinn (1996) Magnitude and timing of episodic sea-level rise during the last deglaciation. Geology, 24, 827-830. Muhs, D. R., J. F. Wehmiller, K. R. Simmons, L. L. York (2003) Quaternary sea-level history of the United States. Developments in Quaternary Science, 1, 147-183, ISSN 1571-0866 DOI:10.1016/S1571-0866(03)01008-X. 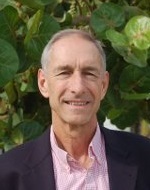 Wdowinski, S., R. Bray, B. P. Kirtman, Z. Wu (2016) Increasing flooding hazard in coastal communities due to rising sea level: Case study of Miami Beach, Florida, Ocean & Coastal Management, 126, 1–8.